I bought M. L. Stedman’s The Light Between Oceans a few months ago to round out an Amazon order for free shipping, and just finally got to it this week. It was the only book I was able to read completely during Bout of Books 6.0. 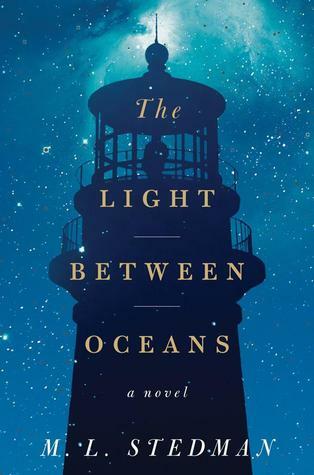 Even though it’s not on the Kansas City Public Library’s suggested reading list for its Adult Winter Reading Program, I thought The Light Between Oceans would fit nicely with the 2013 theme, While the City Sleeps—playing on contrasts of light and dark, day and night—for obvious reasons! I really enjoyed The Light Between Oceans. It poses questions of nature vs. nurture, right and wrong—what may feel right for one person causes pain to another—who are we to judge, etc. It examines the consequences of actions taken with all the best intentions, presenting a moral dilemma that had me thinking about it even when I wasn’t reading. The main characters are all fleshed out well. Tom is stoic and complex—a “strong, silent” type of man, and Isabel is full of youthful enthusiasm and brightness. Her personality is a perfect complement for Tom’s. Other characters include Lucy (the baby girl), the two men who regularly bring supplies to the island, Isabel’s parents, and the family of Hannah, Lucy’s biological mother. Everyone is put into impossible situations, and I felt sympathy for each. I understand why Isabel so desperately wanted to keep the mystery baby. It is clear that Hannah deserves justice and explanations. But the solution isn’t always so simple or black-and-white—there are many complicated emotions involved, and each outcome is potentially heartbreaking. Tom is the best character. His inner struggles with loyalty to his wife, duty to protect, genuine love for the child, and instinct to set things right is genuinely affecting. I loved the author’s illustrative yet lyrical writing style. She made Janus Island come alive for me in her beautifully rendered and vivid descriptions of the lighthouse, the living quarters, gardens, shoreline, cliffs, air, sea, stars, etc. I also was not completely sure what the outcome would be until I finally reached the end of the book—there are several paths it could have taken, all I could have believed, and I did feel satisfied with the ending. Only once in a while did I feel there was slight repetition in the story, or a conversation between characters that dragged for me a bit, but overall it’s a lovely, heartrending novel. The Light Between Oceans was my first read of five books total for the 2013 KC Library Adult Winter Reading Program: While the City Sleeps, hosted by the Kansas City Public Library. Read from January 7 to 12, 2013. This entry was posted in books and tagged 2013 kc library challenge, drama, family, female adolescence, fiction, historical fiction, literature, love by kristin @ my little heart melodies. Bookmark the permalink. Sounds interesting. It has a lovely cover!